Inspector blogging: One of the family. 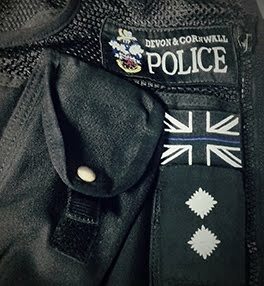 PCSOs, or Police Community Support Officers for those of us in England and Wales1 who still speak English and not Acronym2, started to appear in the Devon and Cornwall Police around 2004. They are awesome members of the police family. Anti-social behaviour was on the rise and on the telly; the two traditional precursors to news outlets letting us know we are going to “crack down” on something. I was a Constable in Cornwall at the time and sure enough we cracked down. PCSOs had been recruited and I had been told to complete the Anti-Social Behaviour Act of 2003 “Eee Learning” package. It's a training method that got it's name after an enthusiastic Yorkshire student was told they were going on a training course devoid of human interaction. Or maybe not. So the office of PCSO held by my current office mates has been around well over 10 years. That is about 253 or so “cop years” which are measured on the relativity based “life experienced” scale. What they do with the powers and authorities they have been given is phenomenal. They work with councils, schools, doctors and social workers to look after vulnerable people. They also contribute to searching for high risk missing persons, staffing cordons at major crimes, conduct the pervasive “concern for welfare” door knocks, shepherd drunks, keep the lid on disputes between neighbours and “crack down” on anti-social behaviour as well as much more. And PCSOs do all this whilst being the approachable, and sometimes only face of policing in their communities. I have no doubt that PCSOs are doing the majority of everything I did as a Constable. However PCSOs are not allowed to be in charge of putting a prosecution case file together, or get involved in the “dynamic and confrontational” aspects of policing the streets. That said, a PCSO and I once got a written pat on the back from a Chief Superintendent following a very exciting bit of rough and tumble. We both collected a few bumps and bruises, and a fellow went off to prison for an extended stay. Just awesome. Alongside the police the 213 Parish and Town Councils in Cornwall and the Isles of Scilly, Cornwall Council, the Fire and Rescue Service, housing associations and others have got much better at working together to address the anti-social behaviour of the few. As is the way of the world, other unpleasant human behaviour is on the rise and on the telly. I am standing by to crack down on it, whatever it may be. I am sure my PCSO colleagues and I will adapt again, perhaps see a new acronym join our family, and embark on another bout of computer based education. PS -- please drive safe, be kind, respect other's stuff. 1PCSO in Scotland stands for Police Custody and Security Officer, a bit like a Detention Officer here but with car keys and lots more collecting and transporting of prisoners and people with the police because they are poorly - in their mental health. 2I am not a big fan of using letters instead of words. Consider World Wide Web versus WWW for instance. 3Which is not as long as Community Service Officers have been around in some Police Departments in the United States of America.